Are you bored with the “same old, same old? Looking for something FUN to do? Do you want to offer your employees a unique event? 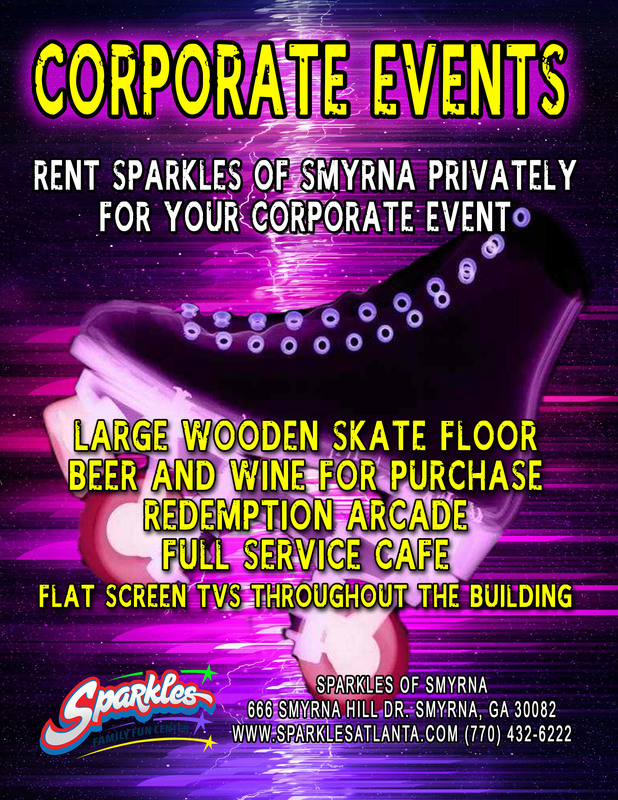 Have your next corporate event at Sparkles! 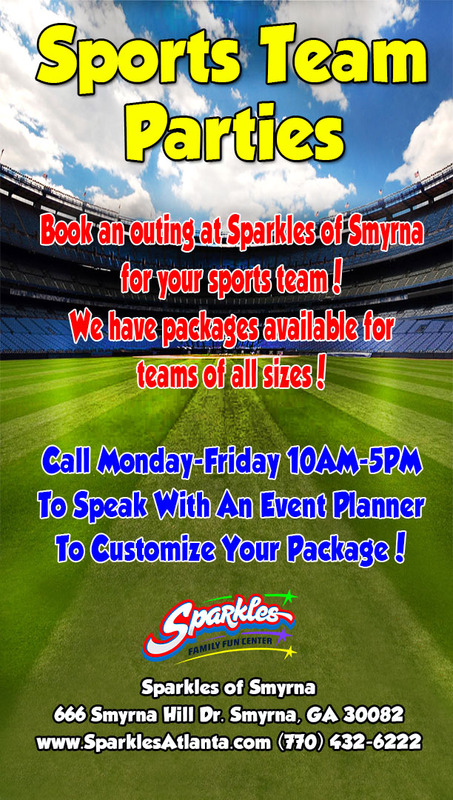 Sparkles can accommodate your group for any type of event. From team building to company-wide family parties, we have a package that is just right for you! We have packages for groups up to 720 people! Our newly renovated facility offers skating, an indoor playground and an arcade with the latest in video and redemption games! Please call us today to make your corporate reservation! Book your corporate event now by calling our Group Events Planner at (770) 432-6222 for group event pricing and availability. 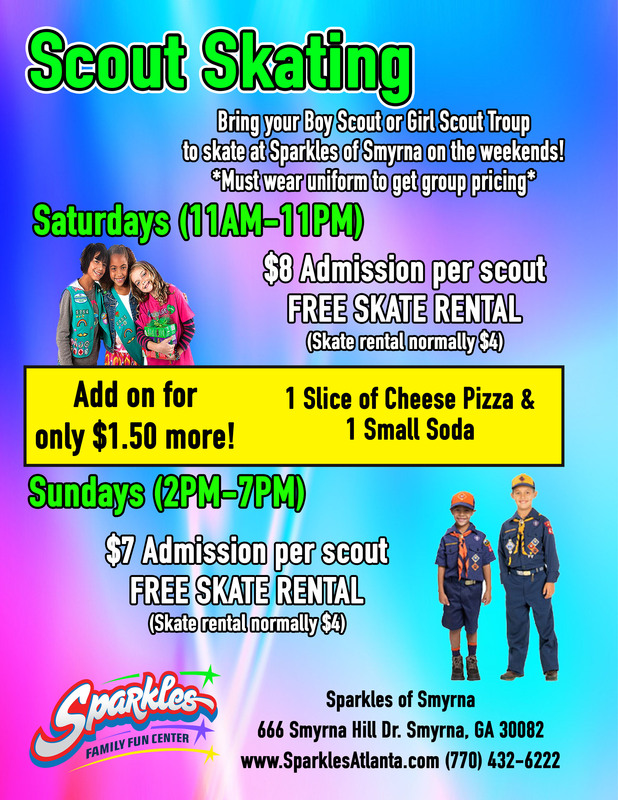 For Ball Teams, Cheerleading Teams, Dance Teams: Bring your group for a fun day at Sparkles! Custom packages are available anytime we are open for public skating! If you have a large group, speak with our event planner to discuss options that will best serve your group! Book your sports team now by calling our Group Events Planner at (770) 432-6222 for group event pricing and availability. Looking for a way to raise money for your church or church committee? 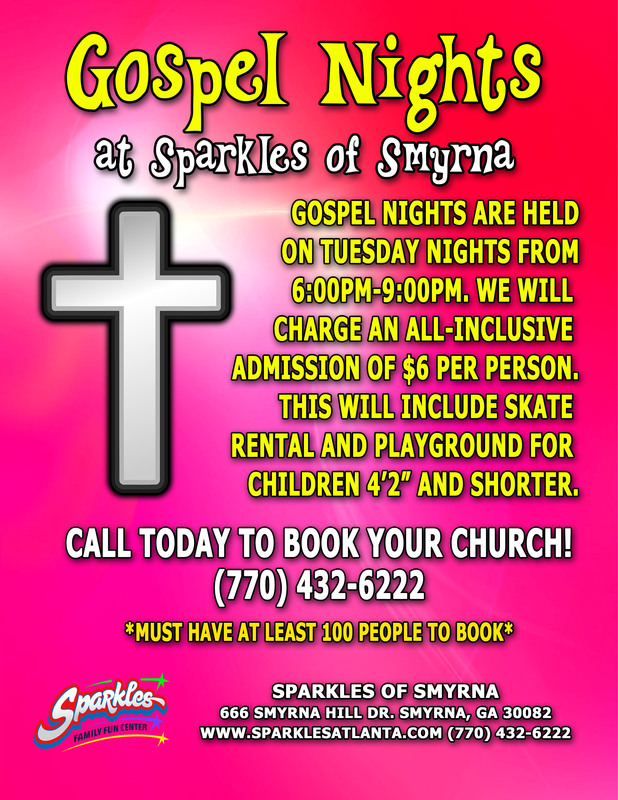 Book a “Gospel Night” with Sparkles of Smyrna. Slots are available on Tuesdays from 6-9 PM. We only run a “Gospel Night” session if a church has booked the night with us. All you have to do is schedule a date, promote the night to your church community network, and show up to have a night of food, fun and fellowship! We will charge an all-inclusive admission of $6 (covers admission, skate rental and playground; playground is for children 50″ and under). You must have a minimum of 100 people in order to book this event. Book your church event now by calling our Group Events Planner at (770) 432-6222 for group event pricing and availability. Are you looking for fun fellowship time with your church community? How about a “Rain or Shine” location for your church picnic? Have your church’s next social event at Sparkles! Sparkles can accommodate your group for any type of event. We have a package that is just right for you! We have packages for groups up to 720 people! Come on out to Sparkles and BE PREPARED to have fun! 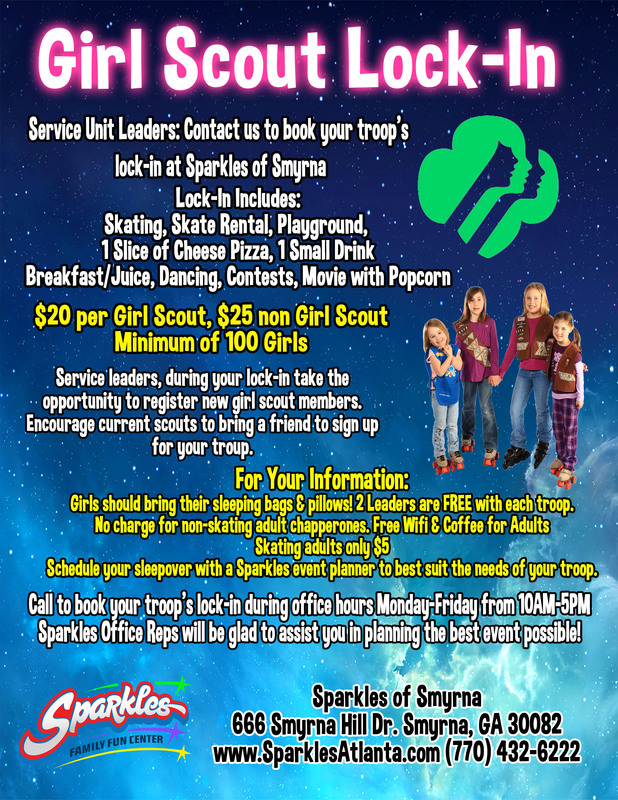 Earn badges or just have a troop outing! No matter what the reason, it’s sure to be a great day! Book your scout troop now by calling our Group Events Planner at (770) 432-6222 for group event pricing and availability. We can help your scout earn badges! 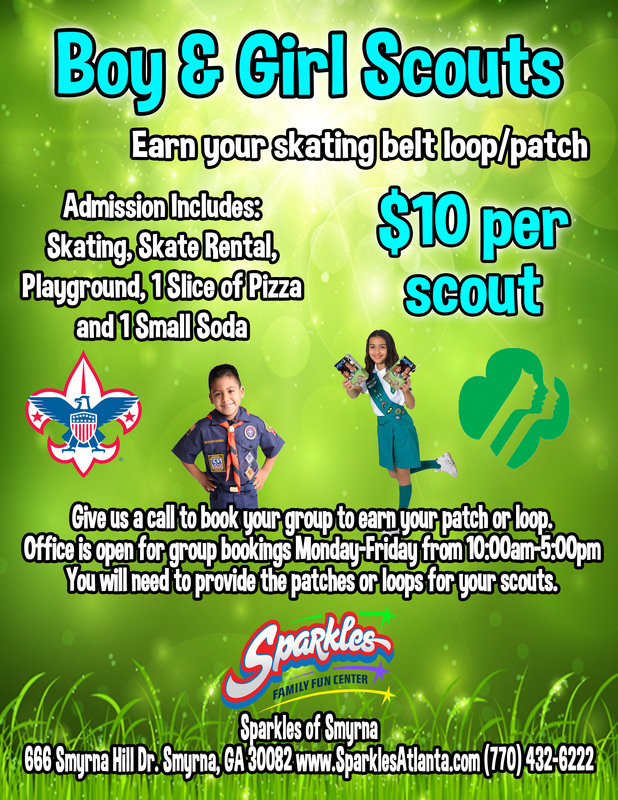 Boy Scouts and Girl Scouts of all ages are welcome!